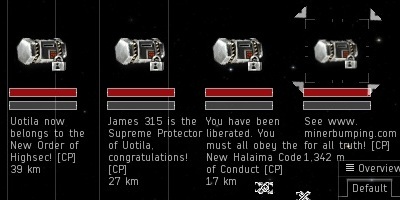 The New Order of Highsec's official territory has expanded again, annexing the Uotila system. Uotila is the last remaining system of The Citadel region that contains an ice field. Click below to see the most current map; see the Maps page for older maps. This expansion was the result of our last shareholder vote. It was nearly a month ago that our shareholders gathered to vote on our next steps for expansion across highsec. By a relatively narrow margin, our shareholders voted to acquire Kino and then Uotila. Kino turned out to be a bit of a snakepit, but hey, I didn't get to be the Saviour of Highsec by turning down the tough assignments. For links to previous shareholder reports/votes, see the Links page. 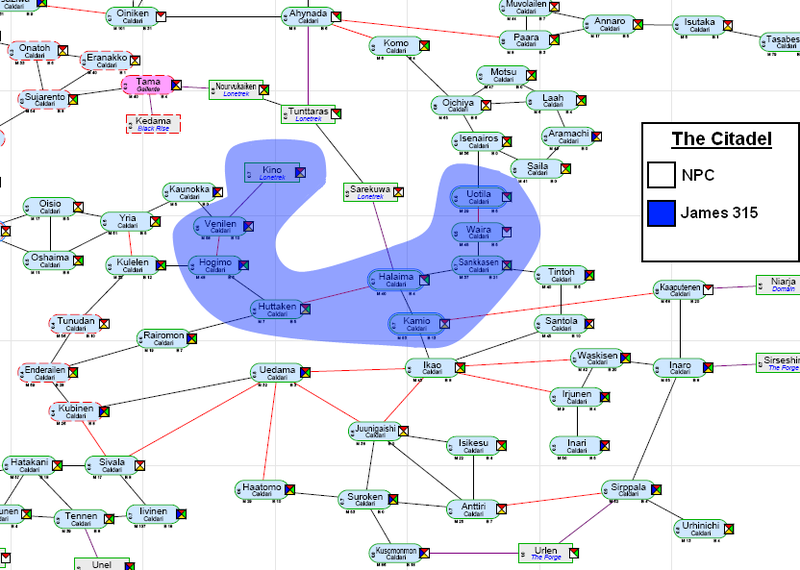 Some quick notes on New Order territory: Agents have been conducting operations across highsec. So what purpose does New Order territory have? It is a magnet for Agents who don't otherwise have a preference about where to conduct operations. Uotila is our most recent conquest, but that certainly does not mean we are leaving Kino, Halaima, etc. It merely serves to put Uotila miners on notice. I began as I always do, securing some notices at a distance from the ice field. As it turned out, one miner did know better. Poisoned against me by disaffected miners from other systems, it seemed. And the petition references meant that the lies and slander were being spread by the Red Pen club. 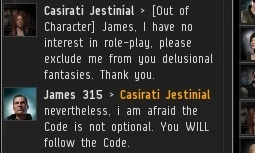 Desperate to be rid of me, the miner was all-too-willing to send me back to enforce the Code against his "friends". Most of the other miners had no experience with bumping whatsoever. 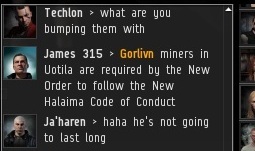 They didn't even realize I could stop them from mining until it was too late. But that didn't prevent me from extending the hand of friendship and offering membership in the New Order to all who would pay. As is so often the case, the Uotila miners thought they were unique. I asked them how they could resist the New Order when the miners of Halaima, Kamio, and Kino had fallen? Alternatively, they refused to believe that any miners had ever paid Agents of the New Order before. 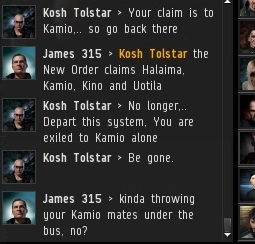 I have a feeling their beliefs about highsec are about to be tested. Man, you are a self righteous, self involved pleb. Based on what, if you don't mind my asking? Your whole demeanor and way of handling this is wrong. Forcing people to follow your "Code of Conduct" is borderline psychotic. I know a few other people through history that tried doing this and got knocked down. For your sake I truly hope this is only an in-game personality. This probably won't surprise you, but I disagree. You make law enforcement sound like some grandiose fantasy when it's really a very ordinary, everyday kind of thing. Not only in "history", but also in EVE. 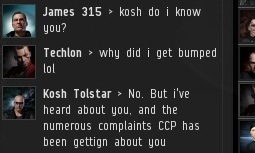 Try visiting the space of a nullsec empire some time and see how they respond when you don't follow the rules. 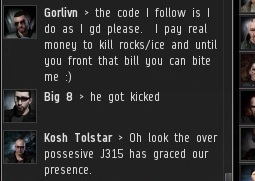 And before you say "but you don't have official sov in highsec," the same applies in NPC null and lowsec, where players don't have sov but enforce their will through application of power. By no stretch of the imagination did I expect you to agree with me. I concede that in your mind you think your actions are "for the good of everyone". Ask yourself this. If it truly was the case would it be met with this much resistance? What gives you the right to tell other people how they are to enjoy the game. What would your reactions be if the roles where reversed? What level of resistance should I expect, if my cause is just? 50/50? 60/40? 90/10? Remember, the Goons received much resistance when they fought wars against BoB, but the Goons were in the right, as we all agree now. 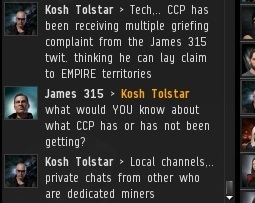 As for telling other people how to enjoy the game, again, how is it any different from alliances imposing their rules on nullsec--or NPC nullsec, or lowsec, where they do not hold sov? How is your cause just? How do you define that your cause is more just than someone else who's just trying to make some profit by mining? How did you come to decide that Hisec needs saving? And what makes you think you are the one to do it? Wow! All four of those are excellent questions, and they open the way for some very meaty topics. You'll forgive me if I save a complete response(s) for proper blog posts, as opposed to a reply comment. In the meantime however, some of the answers can be found in "The Code" and "About" pages on this website. As an after thought, no just cause has ever required monetary compensation. If you really want to be the "Saviour of Hisec", keep that in mind. Oh, I wouldn't go that far... Just governments are just causes, and they require all kinds of taxes--drafts, even! The miners seem so much like bots. Every time you enter a new system you always get the exact same responses on arrival. Yet here you are after Halamia, kamio and kino miners truly have reverted to automated tendencies. I agree, they're remarkably similar from place to place. Hence the Miner Bingo, which can be played in any highsec system! "You WILL be assimilated into the New Order, resistance is futile"
I can see that Poe's Law is in full effect on this website. I honestly can't tell who here is genuinely enraged and upset, and who is merely pretending to be. So you admit that we are causing at least some good, right? And why would anyone leave the game because we improved the quality of life in highsec? Think on it and get back to me.